End Gascon’s Double Standard! Try Amilcar’s Killers! District Attorney George Gascon says he’s about to decide whether to file charges against the officers who killed Amilcar Perez Lopez in February 2015 by six bullets to his back. This Thursday, the Justice for Amilcar Coalition will once again demand the DA charge the officers with murder. And we will join Public Defender Jeff Adachi in calling out the DA’s double standard of consistently exonerating officers who kill civilians while relentlessly prosecuting civilians who allegedly harm an officer. Whenever a civilian allegedly harms an officer, DA Gascón files every charge in the book, often with little evidence. But when a police officer harms or kills a young black or brown person like Amilcar, the DA not only refuses to bring the officer to trial but even tries to paint the victim as the criminal. Despite many officer-involved shootings since he took office, many of them fatal, DA Gascon has charged not a single officer. By contrast, young Mission District Latinos committing relatively minor crimes are often prosecuted and punished severely. If the law is applied so harshly in one instance, why not the other? We’re calling out the DA’s double standard. We want justice for Amilcar, Luis Gongora Pat, Mario Woods, Jessica Williams, and all the other victims of police violence. Check out this recent article in 48hills.org. Although the DA can’t seem to charge the officers who killed Amilcar, he relentlessly pursues a young black man who defended himself from wrongful arrest by BART police–even after a jury had found the young man innocent. This past Friday marked one year and a half since Amilcar was killed. In addition to remembering and honoring Amilcar and the other victims of police violence, we called upon California Attorney General Kamala Harris to take over Amilcar’s case and file the murder charges herself. Read our press release announcing the event and explaining why we are taking these steps. A few of the news reports…. Mission Station is where the officers who killed Amilcar are stationed. We continue to shine a spotlight on them. We haven’t forgotten what they did! Please join us for this week’s vigil. On July 25, several of us asked San Francisco District Attorney George Gascón why, after a year-and-a-half of investigation, he has not filed murder charges against the officers who killed Amilcar. Gascón said he expects to complete his investigation in 6-9 weeks from last Monday. He claimed that, even with solid eyewitness testimony and two separate autopsies, he still lacks enough evidence to prosecute them. He also blamed the current rigged system that protects officers who kill from prosecution. As Public Defender Jeff Adache notes, despite whatever obstacles the rigged judicial system puts in his way, the DA already has all the evidence he needs to bring this case to trial. But it takes courage. True, the DA will face much opposition from the California Law Enforcement community if he files the charges. But he can’t let fear keep him from doing his job. We demand our day in court. Tell Gascón to do the right thing. Hello, my name is __________________. I am a registered San Francisco voter. I want justice for Amilcar Perez Lopez, and I stand with my community in demanding DA Gascón charge the officers who killed Amilcar with murder. The DA must do the right thing. We are waiting and watching! Friday, August 26, 6pm, at the site where Amilcar was killed (Folsom between 24th and 25th). We’ve invited the DA – we want answers. Stay tuned for more details. An alliance of community organizations in San Francisco that have been working to hold the City of San Francisco and the San Francisco Police Department accountable for the deaths of brown and black people who have been killed by the police have been called to receive a human rights award by the City of San Francisco. These groups, including the Idriss Stelley Foundation, Amor for Alex Nieto, Justice 4 Amilcar Perez-Lopez, Do No Harm Coalition, Justice for Luis Gongora Pat, and Justice 4 Jessica Nelson-Williams express deep concern at the actions of the City which seeks to praise their activism while failing to address any of the systemic issues that lead to the disproportionate killing and economic displacement of people of color with no mechanism in place for justice. In response to the lack of justice from the City of San Francisco, the SFPD, its District Attorney, the Attorney General of California and the lack of any binding investigation from the Department of Justice, these groups have contacted the UN Committee on Torture and will be filing a complaint with the International Court of Justice, seeking assistance now from the international community to respond to the crimes against humanity perpetrated by the City on people of color and the economically disadvantaged in San Francisco which continue. In light of the findings of the damning Blue Ribbon Panel and the community’s call for justice, it is crucial that the City acts immediately to suspend the ongoing intimidation by the SFPD, to allow for the prosecution and removal of killer cops from its force, to cease evictions that are destroying the cultural integrity of neighborhoods of people of color and to stop its intimidation and harm of the unhoused. With the police killings of Idriss Stelley, Mario Woods, Alex Nieto, Amilcar Perez Lopez, Luis Gongora Pat and Jessica Nelson, we see a City that is unable to guarantee the protection of human dignity and justice for all of its citizens. Please join us to document the Human Rights Awards Ceremony where each of these groups will voice their respective thoughts on this award and the state of Human Rights in San Francisco. Immediately following, there will be a press conference to answer specific questions from the press. Mission Station is where the officers who killed Amilcar are stationed. We continue to shine a spotlight on them We want them to know we haven’t forgotten what they did! This Monday, several of us met with DA Gascon to review his investigation into Amilcar’s killing. At this week’s vigil, we’ll share what we learned and discuss some possible next steps. We’d like your feedback! Coalitions unite to demand an end to Police Impunity! On the 2nd Anniversary of the killing of Alex Nieto by SFPD (March 21, 2016), the Justice & Love for Alex Nieto Coalition set forth a list of demands to end police impunity. Since then, these demands have been taken up in discussions by a broader coalition of justice groups including Justice & Love for Alex Nieto, Justice for Mario Woods, Justice for Amilcar Perez Lopez, and Honor & Justice for Luis Góngora Pat. Fire Chief Suhr – A first and old demand at last met on May 19, 2016. Despite the hunger strike of the #Frisco5 calling for Mayor Ed Lee to #FireChiefSuhr, despite the fact that this demand became the battle cry of the #Frisco500 to 5000 that took City Hall on a weekend in May 7th ending in 33 arrests, it was the loss of the life of twenty-nine year old Jessica Williams (#SayHerName) to a police bullet on Thursday May 19th 9:45am in the Bayview district (on the birthday of Malcolm X) that finally forced Ed Lee to face-up to the people’s anger and ask Chief Greg Suhr to resign. Jessica Williams was the 22nd fatality under the command of Suhr, the twelfth since 2014, all these fatalities are unaccountable murders (found to be within policy, the latest shootings since 2015 still under review). 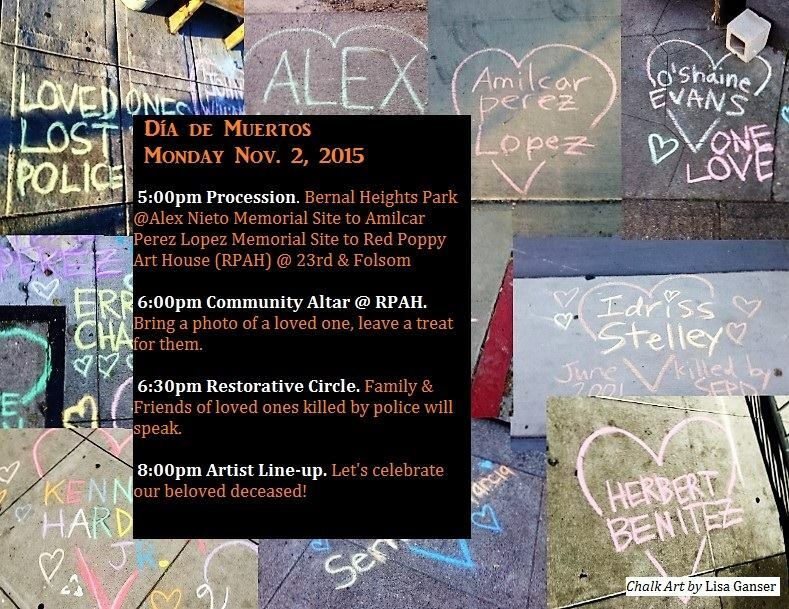 Establish a permanent memorial for Alex Nieto, in collaboration with Elvira and Refugio Nieto at the site where their son was killed in Bernal Heights Park, and where community members have maintained a memorial for two years, as a gesture towards restoring community relations. Establish a permanent memorial for Luis Demetrio Góngora Pat, in collaboration with his family in San Francisco. Inquire of other families who have lost loved ones to an officer-involved shooting if they too would like a permanent memorial, and take actions to create such a memorial. Enforce the January 26, 2016 Board of Supervisor’s resolution that “requests the United States Department of Justice to undertake independent investigation of the shootings of Alex Nieto, Amilcar Lopez-Perez (sic), and Mario Woods and the process by which the SFPD investigates use of force incidents” by establishing an action plan with the DOJ’s Civil Rights Division for an independent federal investigation into those salient cases, including SFPD’s investigation of each case. At this juncture, we demand that said DOJ investigation include all officer-involved shootings since 2014 in which complaints were filed against SFPD or the City, including the killing of Luis Demetrio Góngora Pat on April 7, 2016 and the twenty-seven year old woman murdered by SFPD today. Order the interim Chief of Police to issue bulletins that make alternatives to lethal use of force by SFPD officers unequivocally mandatory in volatile or potentially volatile situations. Ensure adequate training for SFPD officers in line with our demand. Alongside our demands to the Mayor, we are currently working with Supervisor John Avalos on developing a package of reform initiatives to raise SFPD accountability including. We demand that the Mayor, the Police Commission, and SFPD support our legislative package of reform once presented to the appropriate committee within the Board of Supervisors, and support implementation of any such reforms. Provide adequate training for SFPD officers derived from implementation of reforms, including adequate deescalation and crisis intervention training. Justice 4 Amilcar is co-sponsoring this community event for the family of Luis Demetrio Góngora Pat and family and friends of other loved ones killed by SFPD. The family of Luis Góngora Pat invite us to walk with them to the Mission Dolores, where a mass will be held at NOON for Luis. At 9AM, we will begin walking with Elvira and Refugio Nieto and Justice 4 Alex Nieto supporters from Bernal Heights, down Folsom Street to meet friends and supporters of Justice 4 Amilcar near 24th, then continue on Shotwell Street to 19th to meet up with family and friends of Justice 4 Luis Góngora Pat. From there we will continue in procession to the Mission Dolores. After mass, a potluck picnic will be held at Dolores Park. If you don’t want attend mass, please meet us at Dolores Park and help set up a picnic spot! Event co-sponsored by Justice4Luis, Justice4AlexNieto, PoorMAG/PrensaPobre, Mission Neighborhood Resource Center. May 22 is also the Malcom X Day and there is a festival in the Bayview, where Mario Woods, Kenny Harding Jr, and Idriss Stelley are also being honored. Wherever you go, walk with us in resistance. According to the San Francisco Examiner, the Medical Examiner’s Office has confirmed what eye-witnesses, community member’s, and the Perez-Lopez family’s lawyers have been saying for a year. A second autopsy of a young Guatemalan immigrant who was shot dead one year ago today by San Francisco police appears to contradict Police Chief Greg Suhr’s initial claims about the shooting. The autopsy, conducted by the Medical Examiner’s Office and obtained Thursday by the San Francisco Examiner, mirrors the findings of an independent autopsy conducted after Amilcar Perez Lopez, 20, was fatally shot by officers in the Mission district on Feb. 26, 2015. Suhr told the public soon after the shooting that Perez Lopez was lunging at two plainclothes police officers with a knife when they shot him. However, that claim was apparently contradicted last April by an independent autopsy, which showed Perez Lopez had been shot four times in the back, once through the arm and again through the backside of his head. The City’s autopsy reflects that account. On February 26, 2015, Amilcar was shot six times to the back by SFPD. As investigations continue, and demands for intervention by the Federal Justice Department escalate, we remember this young immigrant and his family in Guatemala — in poetry, prayer, dance, a candle-lit vigil and march, and a clear demand for justice and an end to police violence. Join us Friday, February 26, 2016 at 5pm at Folsom St. between 25th and 24th St. Among those joining us: the Danzantes Xitlali and other Bay Area faith leaders, Supervisors David Campos and Malia Cohen, Mission youth leaders, Labor leaders, leaders from the Mario Woods and Alex Nieto Coalitions, and many others. We’ll begin with a vigil at the site of Amilcar’s shooting (Folsom between 24th and 25th), and then march to Mission Police Station. Afterwards, a free community dinner at St. John’s at 15th and Julian (between Valencia and Mission). Join us to celebrate and remember loved ones killed by police. 6:00pm Community Altar @ RPAH. Bring a photo of a loved one, leave a treat for them! 8:00pm Artist Line-up. Let’s celebrate our beloved deceased! *If you are family or close friend of a person killed by police and would like to participate in this restorative circle, please send a message to Adriana Camarena.